Who needs a plane to do aerial photography? Wikipedia defines aerial photography as the taking of photographs of the ground from an elevated position. Usually, in Wikipedia's opinion, the camera is not supported by a ground-based structure. "Why not?" we ask. Traditionally, it is assumed that aerial photography is taken from an aircraft, balloon, rocket, kite, parachute, drone or other similar air-borne platform, with cameras that can be triggered directly by a photographer who is along for the ride or remotely from the ground. Too many photographers have thought that because they couldn’t afford to hire a plane or didn't enjoy death-defying rides or drones that can too easily take a dive and smash along with the camera aboard them, they couldn’t take aerial photos. We’ve never let that stop us from taking aerial shots. We rarely shoot from a plane, but never miss an opportunity to get good aerial shots from elevated places. 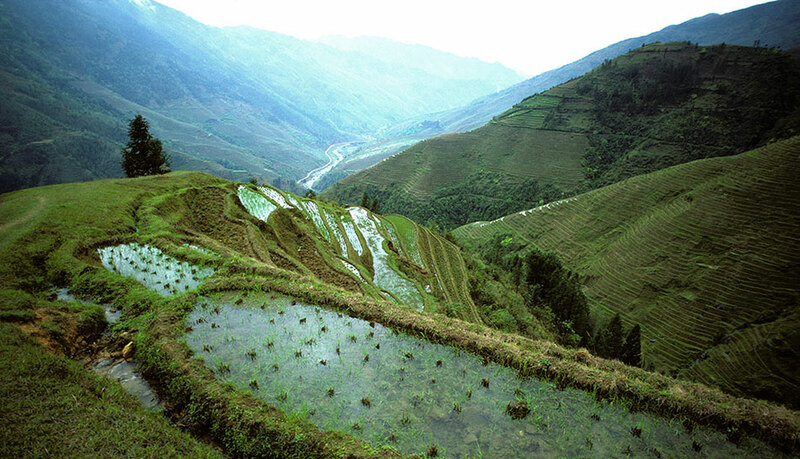 This photo of terraced fields in a mountainous area of southern China was taken from a spot above the fields. 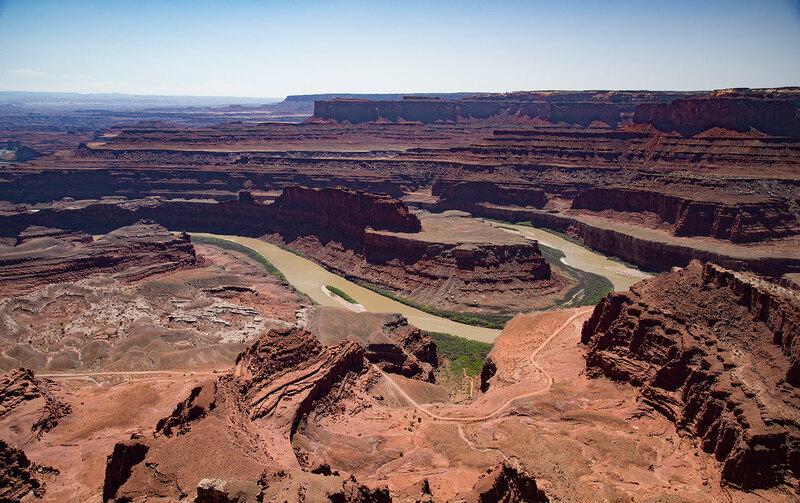 The top photo of the Colorado River was taken from a lookout point on Dead Horse Point in Utah. For aerial photography, bright sunlight and clear skies work better than overcast ones, as they lend the scene higher contrast and enable you to work at higher shutter speeds. The most reliably attractive light is a low sun early in the morning or late in the afternoon, so try to photograph before 11 a.m. or after 2 p.m. on a clear day with blue skies. Shadows are longer and textures are well defined at this time of day. To overcome haze, fly or aim fairly low and use a wide angle lens with a UV filter. A polarizing filter works even better, but it slows the shutter speed. If you do have access to an airplane, the most useful one is a single engine, high-winged one, like a Cessna. Helicopters are better than airplanes, but they cost more and you have to be careful to avoid including the rotor blades in your photos. Try to see if you can shoot a clear view with an open or removed window. Whether you are shooting from a plane, a high building or mountain, plan the photos in advance with a map and mark the locations you want to shoot. Decide whether you need a vertical or horizontal view. For video, you always want to shoot horizontal. If you are working with a pilot, show them your plans in advance and ask their opinion about the best subjects and angles. On the plane, sit directly behind the pilot and talk to them during the flight using the aircraft’s communications system. Check weather reports and the angle of the sun in advance. Use medium telephoto to medium wide angle lenses. Take measures to stabilize the camera, especially for video. Stay below 1000 feet above your subject to avoid haze if you can. Try to keep the sun beside or behind your shooting position to eliminate haze from backlighting. 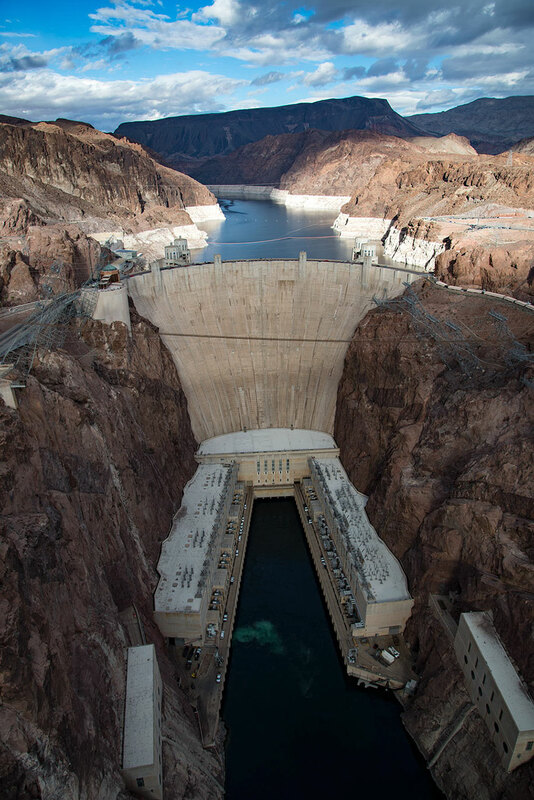 Hoover Dam in Nevada from a bridge. Shoot at an angle, not straight down. Use at least 1/500th of a second and go higher if you can. After shooting daylight photos or video, shoot an hour or so before sunset to get some more moody photos. 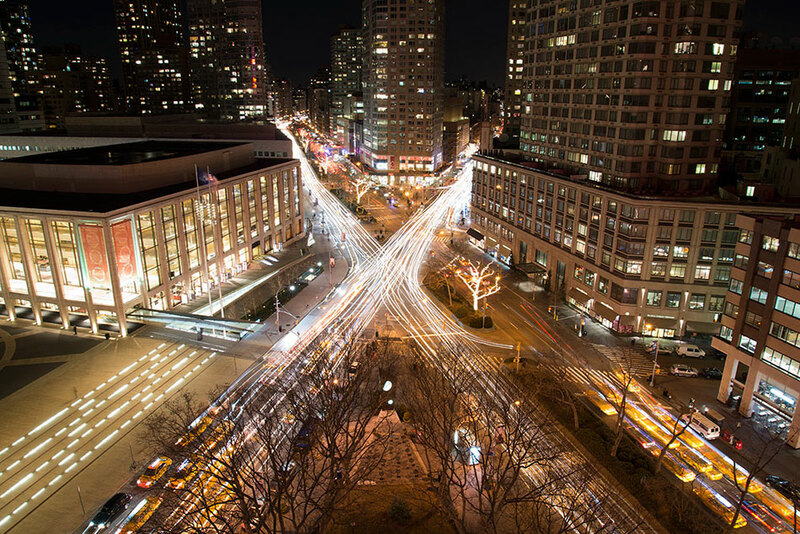 At twilight, shoot photos with city lights. The Lincoln Center in New York City from a nearby highrise. In post processing in Photoshop, use Camera Raw's new de-haze effect to crisp up your photos.